As a consultant at a bridal shop, Heather Stenlake heard every wedding day concern in the book, but one always stuck with her: “how do I use the bathroom in this thing”? 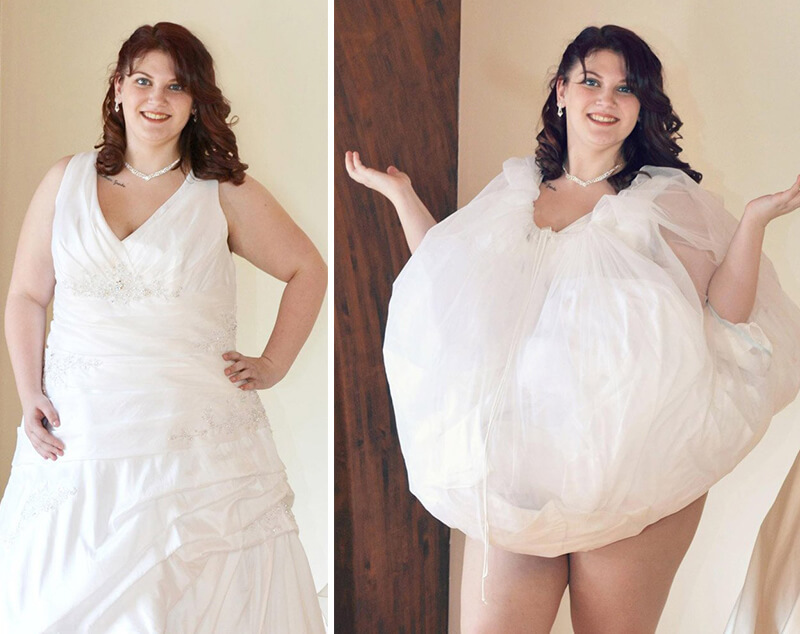 She knew that a bride’s options were pretty limited. She could take her dress off completely, or enlist the help of her bridesmaids to lift all the fabric and join her in the bathroom stall. Neither were very practical—or comfortable—options. That’s when she began working on the Bridal Buddy. This simple, sheer slip is worn at the waist under a gown, and works like a bag. All a bride has to do is gather the fabric in the slip, pull it up over her shoulders, slip her arms through the holes, and go. A drawstring makes it easy to close up tight so no fabric falls through. This leaves the bride feel to go in peace, without fear of ruining the most expensive piece of clothing she’ll likely ever wear. It’s a neat trick that’s designed to help brides, prom-goers or anyone in a fancy dress do something as necessary as breathing: go to the bathroom. During her process of drafting, sewing and prototyping the Bridal Buddy, Stenlake was surprised that there wasn’t anything similar to it on the market. A bride’s only other option for using the restroom on her big day was to ask her bridesmaids to assist. That is, unless she was willing to take the dress off completely first. That still might require assistance. Stenlake began working on the Bridal Buddy in 2002, during her time as a consultant at a bridal shop in Pennsylvania. As with many things in life, responsibilities popped up and she found herself focusing more on being a Mom than on being an inventor. Raising her two young daughters, however, didn’t stop her from being an entrepreneur. Stenlake owned her own bridal shop with her sister, and now owns an e-business creating custom invitations for weddings. In 2015, she revisited that hand-sewn prototype in the basement and knew it was time to bring it to light. Bridal Buddy is her very first invention. The bridal business is something Stenlake knows all too well. Now, helping brides do their business is her top priority. The product was a big hit at the bridal shows Stenlake attended, where women were in awe of the super-simple design. Since the brand’s launch in 2015, it has been featured in Today, Mashable and BuzzFeed. Bridal Buddy continues to make waves and help make any wedding day go a little bit smoother.